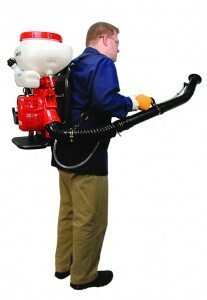 PRODUCT DESCRIPTION: This is a gas powered back pack fogging machine which has a liquid tank that will hold 3.25 gallons. It is able to pump over 4 ounces of chemical per minute and is great for treating areas where no electricity is available. It's also handy for the applicator who has several locations to treat and needs portability. This sprayer is so powerful and efficient that once you start using it, you will never want to use a regular pump sprayer again! Mist blowing is extremely effective on flying pests like mosquitoes, gnats, biting flies, midges, noseeums and more. You'll be able to treat large areas in no time, use less chemical and do a more thorough job compared to liquid spraying. The Solo 451 is very much the "Cadillac" of mist blowers. Its easy to start, very powerful and comfortable to wear. RATE OF APPLICATION: Adjustable rate of less than an ounce per minute to over 4 ounces per minute. Mist, fog and ULV capable. All tips are included. Can even apply dust. If this is overkill for your needs, go with one of our electric models like the FM 5330 MINI FOGGER, the FM 6308 TRI JET or the FM 6309 FOGGER. 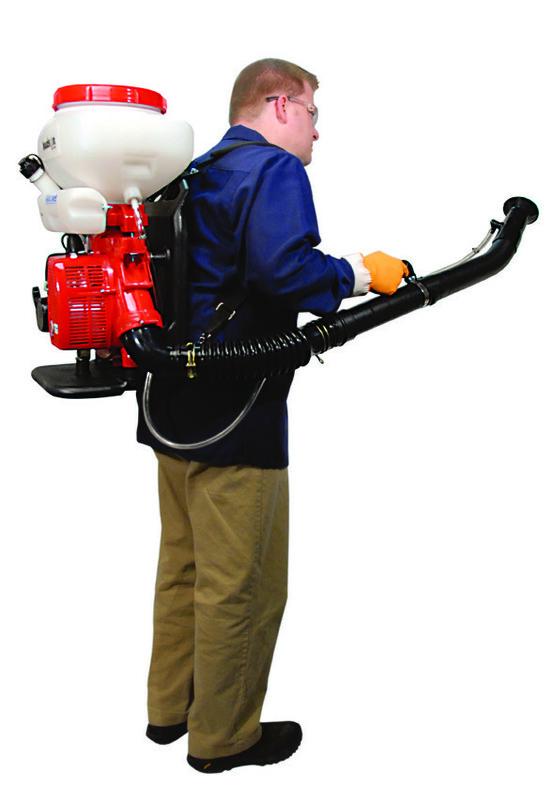 PRODUCT DESCRIPTION: The Hudson Mist Blower is a good entry level machine and for most home owners, a good option if you won't be fogging for long periods of time. Like the Solo, the Hudson will convert liquid to a mist and enable the user to treat large areas efficiently. For the most part the Hudson performs like the Solo but there are notable differences. The big difference is in comfort. The Solo is very comfortable to use. 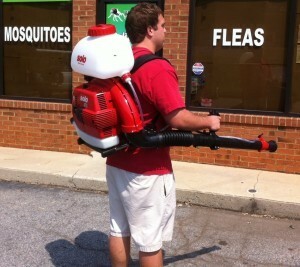 In fact one almost forgets they are carrying around a 2.5 HP motor on their back. The Hudson is not as forgiving. The 2.4 HP motor will be noticeably louder and the unit vibrates more. If you only expect to be using the machine an hour or less, this shouldn't be an issue. But if you plan on fogging for several hours a week, get the Solo. The other big difference is in the controls. The Solo has a very easy to adjust flow regulator and throttle. And its easier to start. OTHER DETAILS: The Hudson has a 3.5 gallon tank and can be converted to blow dust. The fuel tank is just over 1/4 gallon and it requires standard 2 cycle mixtures (25 parts fuel to 1 part oil). The mist can reach out 35-40 feet (compared to the Solo which will reach out over 50 feet). SUMMARY: The Hudson is a good low cost mist blower and will be more than adequate for anyone needing to maintain 2 acres or less. But if you plan on using this tool for more than an hour a day, get the more comfortable and easier to use Solo.